My teenager wants to become a vegetarian. How can I make sure he’s getting the right nourishment? Your son is one of many teens who are making the decision to become a vegetarian. People who choose vegetarian diets do so for any number of reasons, whether it’s a desire to get more of their nutrition from plant-based foods or a concern for animal welfare. Following a vegetarian diet is easier than it used to be. And with the growing availability of foods from other cultures, vegetarian diets have become a lot more interesting too. There’s more than one type of vegetarian diet. Lacto-ovo-vegetarians do not eat meat, fish, fowl or products containing these foods, but they do eat dairy products and eggs. Vegans, on the other hand, have a more limited diet since they eat no animal products at all. For many parents, their biggest worry about letting their children follow a vegetarian diet is how they will get enough protein. But cutting out meat doesn’t mean they can’t get complete nutrition and a balanced diet. There are plant food sources of protein such as soy products (e.g. tofu), legumes (beans and lentils), cereals, seeds, nuts, and their butters (e.g. peanut butter, almond butter). Each option offers different benefits so eating a variety of these will promote good nutrition. 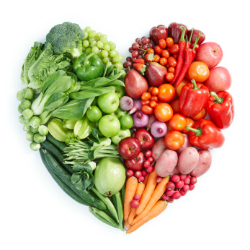 Health Canada, through Canada’s Food Guide, and Dietitians of Canada both support well-balanced vegetarian diets, as long as they provide enough energy and the right amount of vitamins and minerals. A balanced diet should provide adequate protein intake and all nutrients including sources of essential fatty acids, iron, zinc, calcium and vitamins B12 and D.
Vegetarians have to monitor their intake of iron, zinc and calcium since these may not be as readily available in their food choices. Vegans usually require a supplement of these nutrients as well as vitamins B12 and D. Anyone who doesn’t eat fish or eggs, which are good sources of essential fatty acids, should also include flaxseed, canola, nut oils and soya products in their diets. Parents also need to remember that if their teenager is still growing (and most are) then their nutritional needs are greater. Canada’s Food Guide has lots of information and recommendations on how to create a healthy diet including a customizable section called “My Food Guide”.